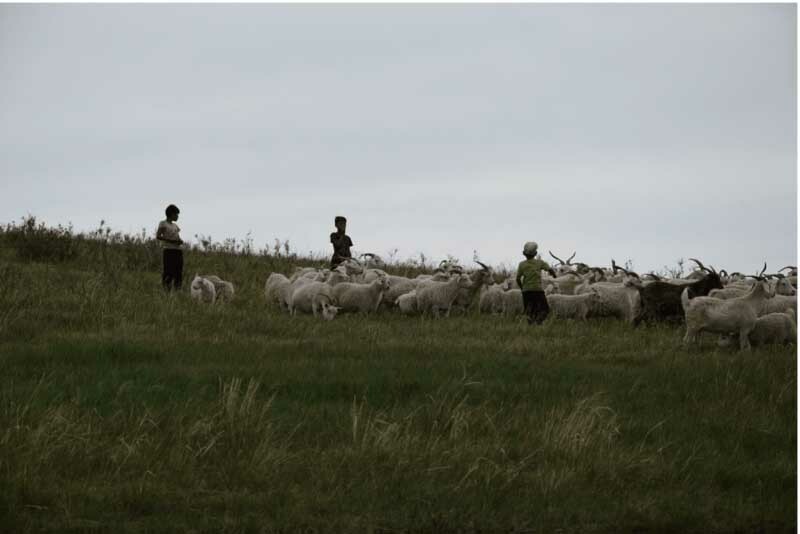 This summer I went there to explore the Tuvan traditions, in particular their spirituality. 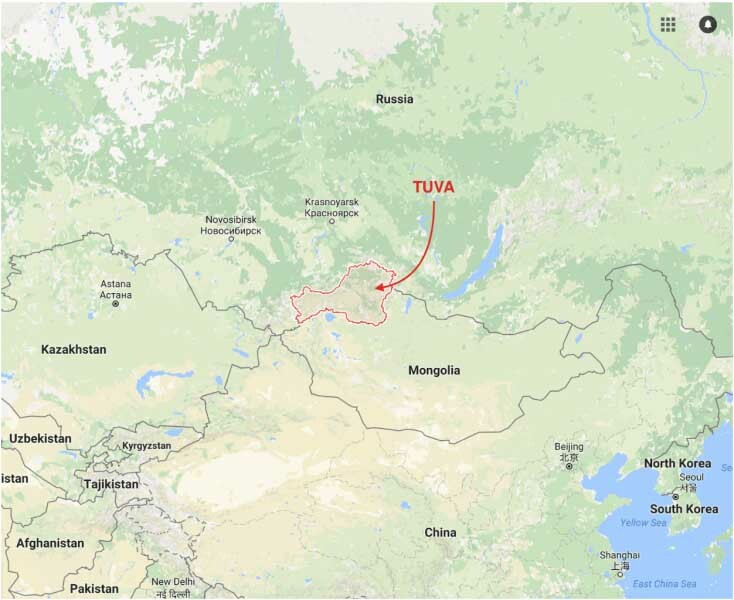 Tuva is about half the size of France with only 300,000 inhabitants, most of them ethnic Tuvans. The Tuvans have traditionally lived as nomadic herders of sheep, camels, horses and even reindeer. A group of children herding goats and sheep. The kids start to help out with the herding early - the youngest one here was just seven. 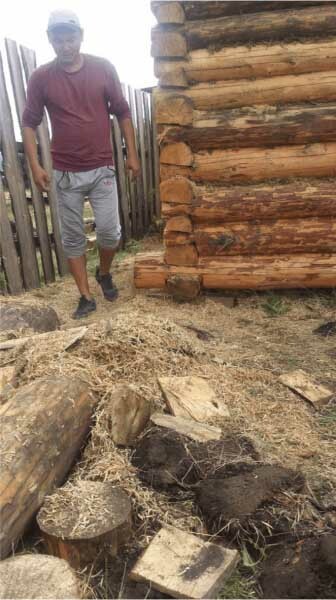 The culture is somewhat similar to that of Mongolia - for example, yurt dwellings, which are traditional in Mongolia, are also part of Tuvan culture. I was interested in the Tuvan culture because I come from a similar culture myself, the Saami of Sweden. 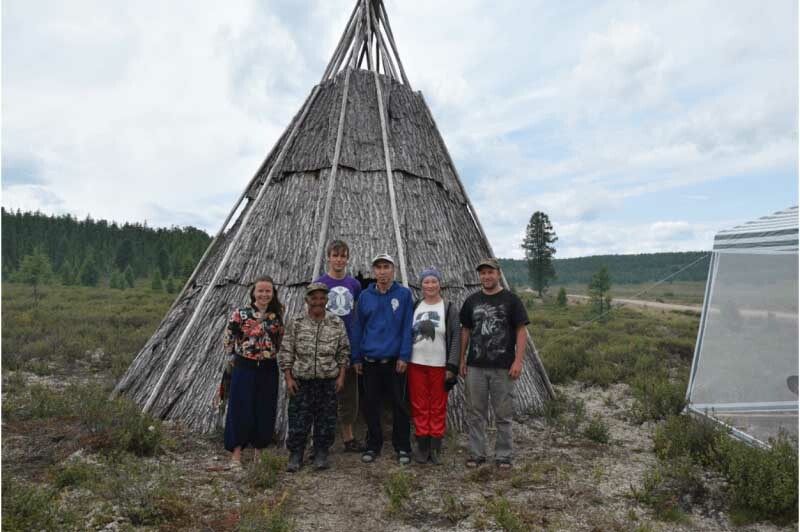 Traditionally we are a nomadic people mostly involved with reindeer herding and our traditional dwelling is a teepee. Our spiritual traditions are also similar to that of the Tuvans—generally known as shamanism. The shamanic tradition is surprisingly similar throughout Siberia all the way to Sápmi, which is the Saami area of northern Scandinavia and the Russian Kola Peninsula. 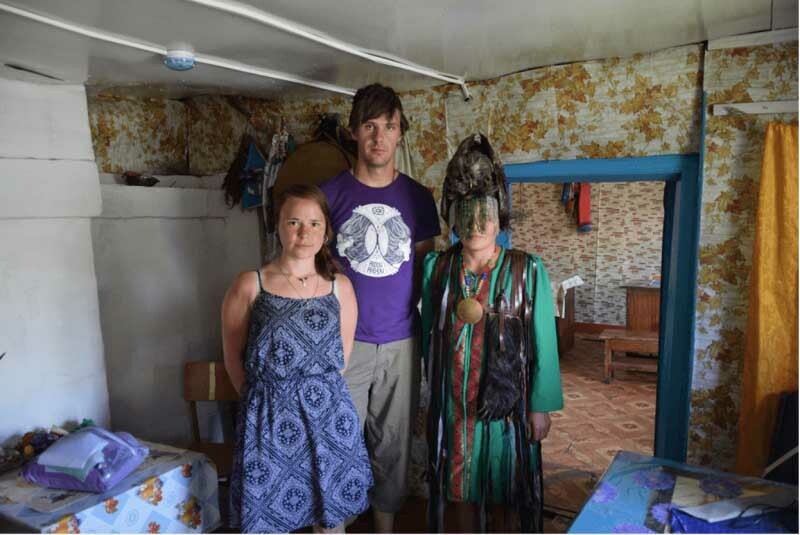 For centuries, shamanism in both Siberia and in Sápmi have been under attack from the state governments and other religions. Soviet rule sought to completely eradicate religion in Tuva, and shamanism was driven underground. Despite this, shamanism flourishes once again and is practised openly in both Siberia and Sápmi. In Tuva it even has the status of state religion along with Buddhism. 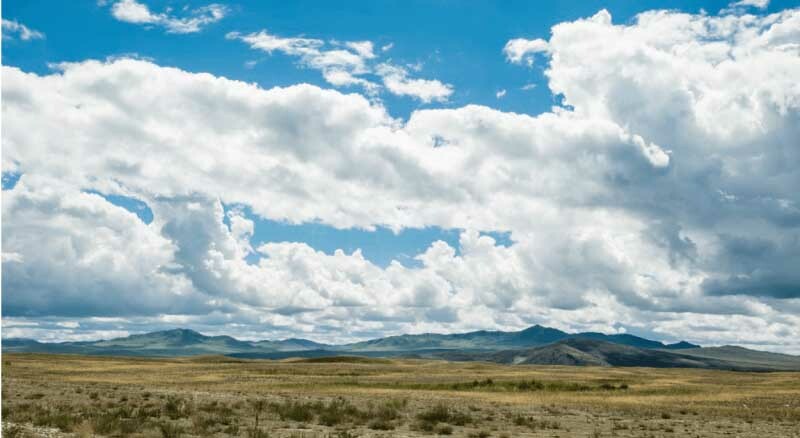 The stunning landscape of the Tuvan steppe. As a traditional Saami handicrafter, I have made many drums for Saami shamans. I am also a practitioner of this spirituality, so Tuva, with shamanism as a state religion, was very intriguing to me. Luck would have it that I have a friend in Tuva, a shaman working in their traditions. He invited me there, and naturally I accepted. I am also familiar with the Gokhale Method, since I suffered from very severe back pain in 2014, and attended one of Esther’s workshops in Germany. So part of the plan for my visit was to also explore the Tuvans’ posture. 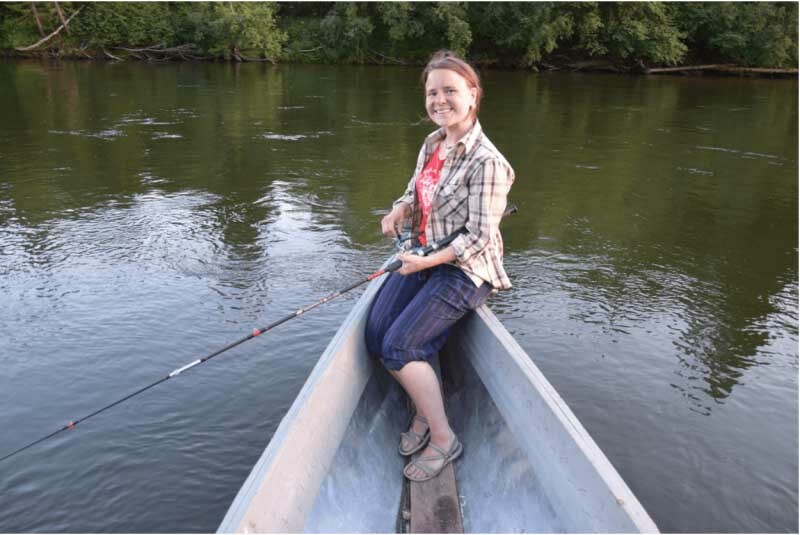 My girlfriend Inga-Wiktoria stacksitting on the edge of the boat while fishing on the mighty Jenisej river. 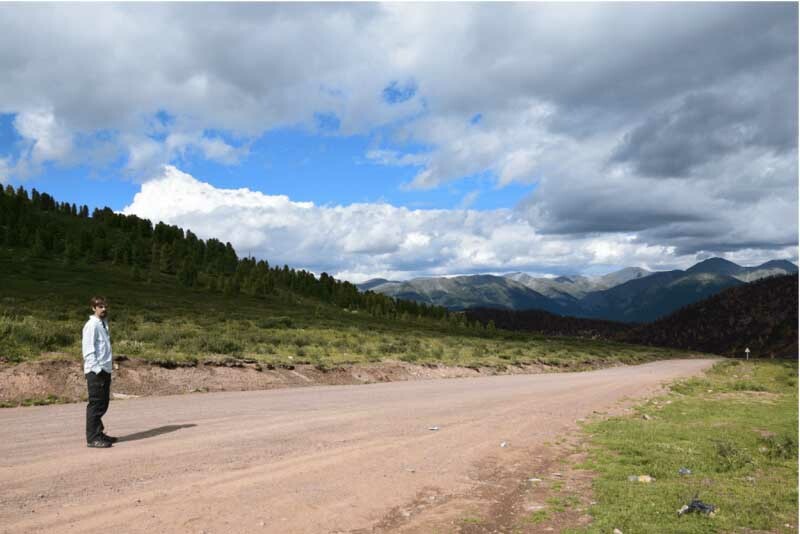 For almost two weeks we traveled around Tuva on dusty roads and in the wilderness. We met a lot of different people, both Russians and Tuvans. As we expected, a lot of people there have quite good posture, since they are involved in a lot of traditional work. One of our new friends with shoulders back and rib anchor firmly in place. 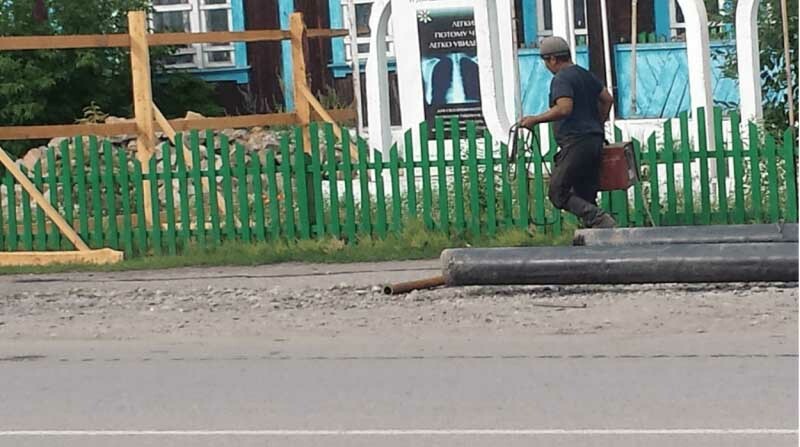 What struck both my girlfriend and me was that almost all the Tuvans had good posture but the Russians did not. The Russians are a minority in Tuva these days, but historically they have made up as much as 30 percent of the population. So despite living alongside each other they have very different posture traditions—although it has to be said that it seems like the Russians in general have better posture than the average American or Swede. A Tuvan carrying a heavy load with good back and posterior shoulder posture. 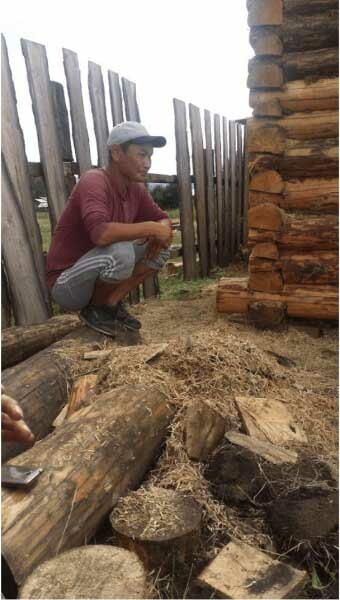 A group of Tuvans in a small village we visited was digging a new latrine; this man worked with really good form, and displayed excellent walking form with feet pointing slightly out and pushing with the back leg and toes. They took turns digging and the resting position was of course squatting. In the first week we went to a holy spring not far from the Mongolian border. 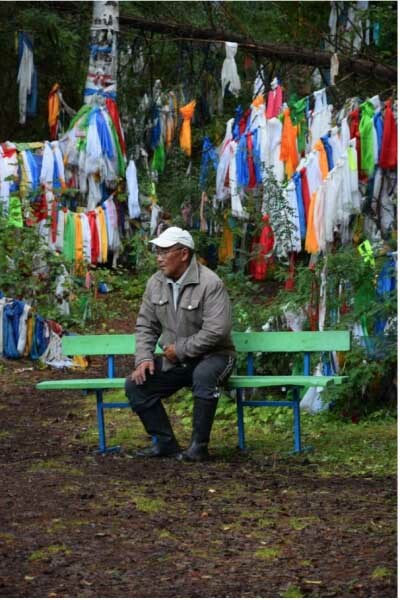 There are a lot of springs where Tuvans go, which they find healing for various types of illnesses. There are many different springs for heart disease, rashes, and even back pain! These springs are also popular places to visit during summer, and whole families go to camp and relax together. At the spring we visited, there were a lot of Tuvans there and it was immediately clear that Tuvans in general have pretty good posture. A visitor at the holy spring, stacksitting with thighs angled down and legs slightly open to receive the anteverted pelvis. We went to a lot of places all across Tuva, which easily could be described as a land of extremes. There are mountains with pine trees, glaciers, as well as deserts where camels live. In summer it can get as hot as 105˚F and in winter minus 60˚F. Back home we rarely experience 85˚F in summer so we really did suffer the summer heat! Endless roads through the mountains (Esther’s note: Fredrik has made great progress with his posture. When I first met him, he had been doing his carving round-shouldered; he took the instruction of the course to heart and here you see him with very nice posture indeed). In the mountains we felt more at home both with the temperature and the terrain, and we even met some fellow reindeer herders! 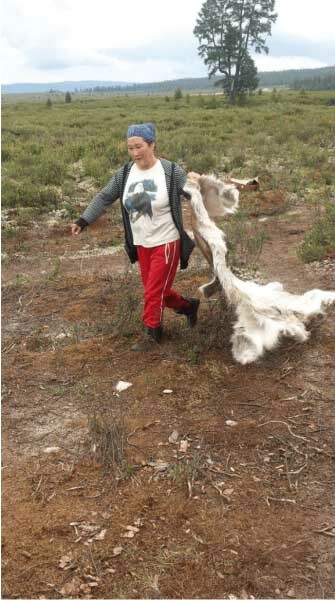 There is actually a minority in Tuva working with reindeer in the mountains. They speak a different dialect than the other Tuvans and just like us Saami they live in teepees not yurts. Our new friends, the reindeer herders of Tuva, and our guide on the right. Nadeshda showing us one of their skins; the conversation naturally was about reindeers! Shoulders back and good glidewalking. The connection was instant despite several thousand miles between our two peoples. It really felt like meeting our long lost cousins. We received an invitation to visit them and their main camp, which we unfortunately did not have time to visit on this trip since it was four days away on horseback. 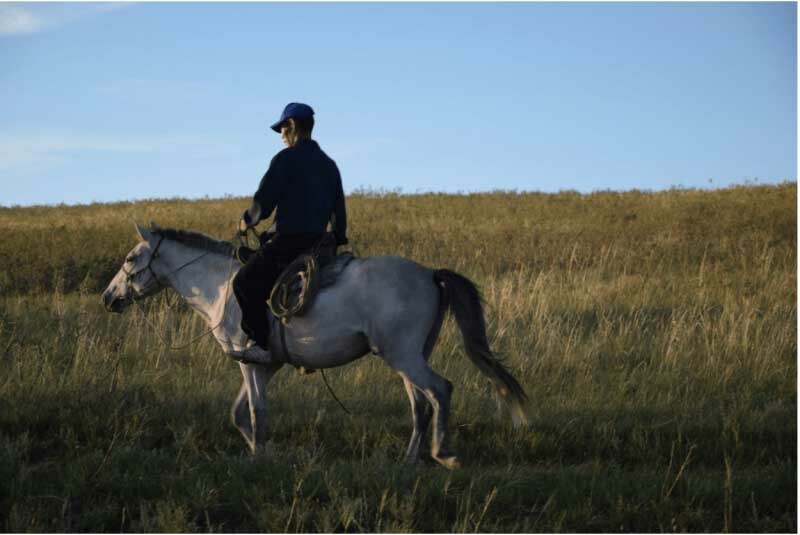 One of the many nomads of Tuva, with really good riding form - straight back and chin angled slightly down. 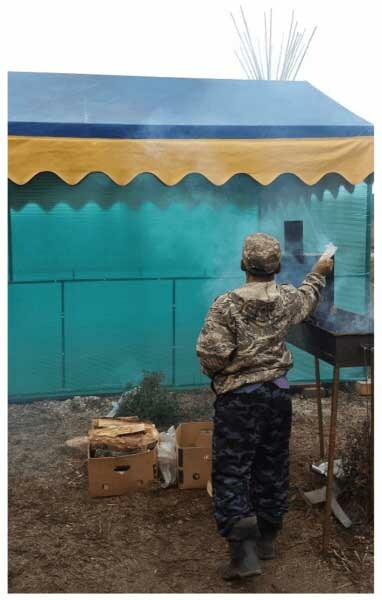 In the capital of Tuva, Kyzyl, there are shaman clinics where people go to find remedies for all sorts of ailments. At the clinics, which are run by different shaman organizations, shamans work on a daily basis with patients much like an MD in a hospital in the US. At one of the clinics we met Hurugay, a shamaness working for Dungur, the largest and oldest of the Tuvan shaman organizations. She was very welcoming and open about her work and the Tuvan traditions. Inga-Wiktoria and I with shamaness Hurugay at the clinic in Kyzyl; Hurugay had really good posture, here tallstanding with shoulders back. We camped for the two weeks of our trip and slept on the ground for most of the time. This was something I did a lot when I was younger but later on learned to fear because of my back issues. Since regaining the posture health I had lost, my back is really a non-issue and two weeks sleeping on the ground was no problem. Tuva gave us a lot, both spiritually and posturally. Esther's note: A huge thank you to Fredrik for sharing these marvelous experiences and observations with us! Please feel free to comment and ask questions here. I love when all meets in one! Travel, culture, nature, spirituality and good posture! Who said "specialization is for insects" was right! How magnificent are the human possibilities, just when slightly expressed! Thank you Esther for another power-boost in my posture journey and thank you a lot Fredrik! Love this!! Thanks so much for sharing! A very interesting article with beautiful pictures. The photo of the Tuvan riding a horse is most impressive. Not only is it good posture generally, it is excellent riding form. I have long wanted to recommend that the photo of the girl in 8 Steps (on p. 70) be replaced in future editions, because while her torso posture is good, her riding form is not. Her legs are braced forward in the stirrups and she appears to be balancing on the horse's mouth. This results in very poor 'posture' on the part of the horse - a bulging lower neck and hollow back - not a pain-free back for the horse! The Tuvan is doing MUCH better, as is his relaxed horse with lowered head and level back. Wow! Thank you so much for sharing your expertise! I am not a horserider and did not see all the aspects, now clear, you point out in the picture (Fig. 3-1) of the girl riding. Yes, the Tuvan and his horse look relaxed and beautiful. I wil request Fredrik for permission to use this photo in a future edition / printing. Dear Esther and Fredrik - thank you so much for sharing this. It moved me deeply. Shamanism speaks to my soul as I feel it to be the original religion of most cultures. I am so glad there are places in this world where it it still alive. I hope this continues. I feel grateful to have such a close link to the practice through Fredrik, who is someone I have spent a weekend teaching, a week traveling and living with in Saamiland, and many hours taling with over Skype and emailing. I trust him, and respect his integrity and depth. People like him, who pursue things that interest them with passion and perseverance, are not super common - I believe we are all lucky to have a connection with him.